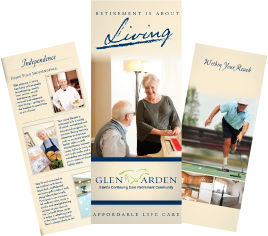 Goshen, NY – Glen Arden, Inc., Orange County’s premiere continuing care retirement community introduced their first “History Remembered” ceremony with a reenactment on events leading up to the Revolutionary war. This was a two women performance starring Glen Arden’s Activity Director, Sulekah Zaug, and history buff Roseanne Mytych. This reenactment was in honor of Independence Day to give the residents an accurate series of events that sparked the start of the Revolutionary War. The play was a dramatic comedy and featured characters such as Uncle Sam, Colonist, and the British soldiers. Events were brought back to life including the Boston Massacre, Boston Tea Party, and the first shots fired starting the war. Real letters were also read, expressing the Colonist and British point of views. Residents were thrilled with the performance and had nothing but positive comments to express towards the actors. With many retired teachers as residents, the fun twist on teaching history was truly enjoyed. “I was so thrilled to be able to create this event for our residents and bring history alive! I’m constantly thinking of unique programs to set us apart but relevant to our resident’s interests. Entertainment and humor goes a long way especially when based on real events. I think we’ve found our niche! Stay tuned…” said Activity Director Sulekha Zaug. “History Remembered” will become a quarterly event at Glen Arden, bringing history alive for a fun-entertaining look back on America’s past. For more information on “History Remembered”, Glen Arden, Inc., or to learn more about their services, please visit their website at www.glenardenny.com, or call their office 845.360.1443.